Are you tired of keeping track of missing work in your classroom? Do you spend your planning time notifying parents of missing work? This form has helped me manage the homework procedures in my classroom. 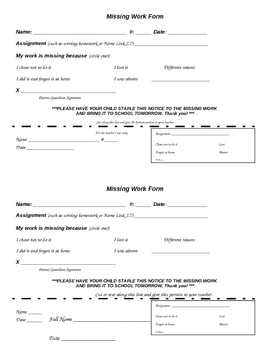 If a student does not have his homework, he independently completes the missing work form. It is cut apart and the bottom slip is placed in the homework basket. The top slip is taken home, stapled to the completed work, and needs to have a parent signature before being returned to the classroom.